Enjoy great web exclusive prices, free gift vouchers, free mobile fitting and more when you buy your tyres online. All the top brands are stocked such as Continental, Goodyear, Michelin, Pirelli and more. Where do I use my Kwik Fit voucher code? Select the Kwik Fit discount code you wish to use and copy it. Follow our link to Kwik Fit’s website. Add the services you require to your basket. When you’re ready to check out, click ‘Basket’ in the top right-hand corner of the screen. Once you're happy with your order, click 'Continue’. You can now insert your Offer Code in the box. Click ‘Apply Code’ and your discount will be applied to your order. Agree to the Terms and Conditions and continue to the payment page to complete your order. "Enjoy great savings in the offers section." "Find money saving codes on the Kwik Fit homepage." Kwik Fit is the UK's leading fast-fit specialist. Buying your tyres online from Kwik Fit can save you money as they have an extensive range of over 60,000 tyres in stock from leading brands like Pirelli, Michelin and Goodyear, at web exclusive prices. Once you have selected your tyres you can book your appointment in advance at one of over 600 centres nationwide. You don't even need to go to them to have your tyres fitted, as they offer a mobile fitting service and will come to either your home or your workplace to fit your tyres. They also have great deals on MOT testing, car servicing, exhausts, batteries, brakes and much more. You can book a free Brake Check Appointment at Kwik Fit. If you think that your brakes are not performing as they should or you want them to be checked before embarking on a long journey then you can book an appointment online and then take your car to their brake technicians who will complete a free, no-obligation brake inspection. After the inspection, they will give you a written brake report and a quote for any work that might be needed. It couldn't be simpler, just visit their website, enter your car's registration and click search! You can book a free Exhaust Check Appointment at Kwik Fit, If you are worried that your exhaust or catalytic converter is not performing as it's supposed to, then you should book an appointment online at Kwik Fit. Once you have made your booking, you just take your vehicle to the centre of your choice and let the expert technicians complete a free, no-obligation inspection. When they have completed their inspection, they will give you a written report and a quote for any work that might be required. Do Kwik Fit repair tyres? If your tyres meet The British Standard reflected by Kwik Fit then they’ll offer you a repair as opposed to replacing the damaged tyres. The experts at Kwik Fit will be able to tell you if your tyre is repairable after an assessment at your nearest Kwik Fit garage. How much is a MOT at Kwik Fit? The cost of a MOT at Kwik Fit starts at just £27. 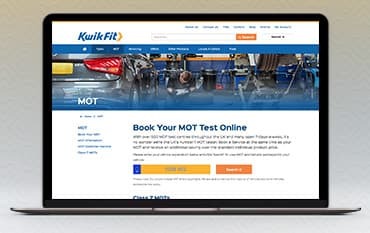 For all price information, and an exact price for a MOT on your vehicle, enter your reg and book your service online at Kwik Fit. How do I book a Kwik Fit tyre swap? Book your Kwik Fit tyre swap appointment securely online to get your winter tyres fitted or removed from your car at your local Kwik Fit Garage. Where is my nearest Kwik Fit centre? You can find your nearest Kwik Fit by clicking here. Kwik Fit have over 600 centres spread across the UK and specialise in automotive parts repair. Use our Kwik Fit Offer Codes to save money when you book your next MoT or service. As the county's leading fast-fit supplier of tyres, you can find products from all the top tyre manufacturers including Michelin, Dunlop and Pirelli. Whether you need a windscreen repair or air conditioning recharge, Kwik Fit has everything you require to help your car run smoothly. We are constantly on the hunt for first order Offer Codes for Kwik Fit to help you with your money saving. Our experts check dozens of sites for secret codes including NHS discounts, student sites & social media channels saving you time & money!